To perform high quality auto repair service at a fair and just price. To employ the best skilled technicians and mechanics available. To furnish an itemized invoice for fairly priced parts and services which clearly identifies any used or remanufactured parts. Replaced parts may be inspected upon request. To maintain customer service records for three years or more. 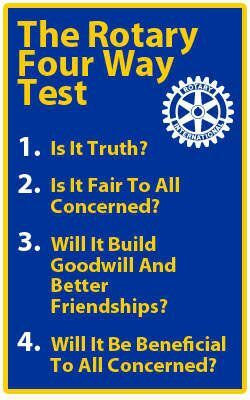 George Rode is president of the Southtowne Rotary and very much believes in the four way test.